Ormamail works daily with the information and personal data of companies and customers. We use it respecting the contract terms and conditions. This is the reason why our partners feel confident working with us, knowing that confidentiality will be respected. We are certified and respect the norms established by the LOPD (Personal Data Protection Law). 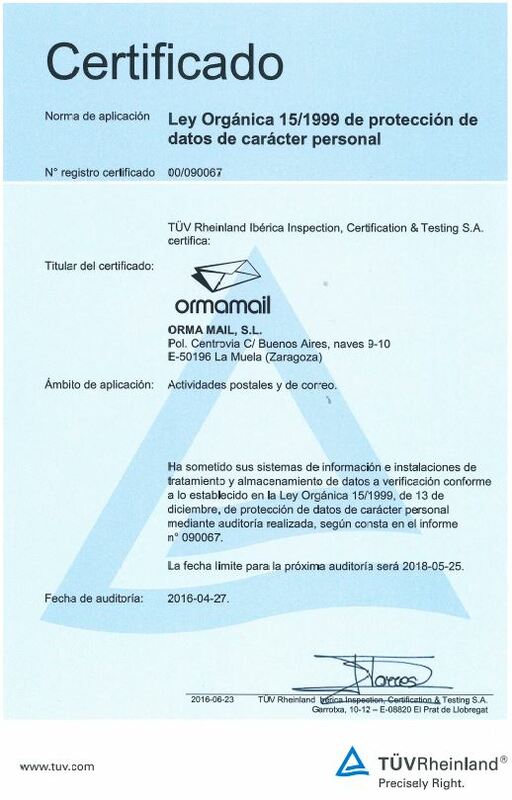 Ormamail thinks that data security is a fundamental obligation so in this way we own the latest technology and have the most qualified staff that respect the informatics security handbook based on Law 15/1999, Directive 95/46 and Royal Decree 994/1999. Our close cooperation with Correos oblige us to be registered on the General Register of Postal Service Suppliers. We work under the supervision of the Development Ministry and we get audited every year by the National Commission for Market and Competition (CNMC) for the full respect of the postal market norms.